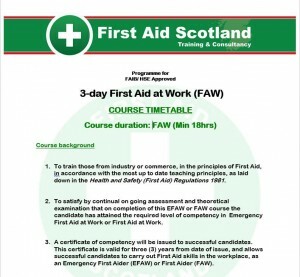 FAW « First Aid Scotland Ltd.
Public Course Cost Public courses : £210.00 + vat per delegate. Description This Full First Aid at Work (FAW) course is the comprehensive level first aid course for training individuals to act as first aiders within the workplace, and is both First Aid Industry Body (FAIB) approved, and run to the current Resuscitation Council (UK) 2010 guidelines. It is an 3 day (18 hour) course, designed to equip a person to take on the full role of a workplace first aider with comprehensive skills as per Health & Safety recommended guidelines. 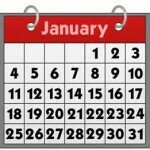 Following successful ongoing assessment, this qualification certifies the first aider for a 3 year period from date of qualification. Health & Safety recommendations are that each qualified first aider should undertake an annual skills update to refresh their practical skills once qualified.The course is both informative, and fun, and delegates are actively encouraged to contribute (we don’t like death by powerpoint any more than the next), and student feedback indicates we’re doing it right. Delegates presented for training should be of a suitable physical, mental and psychological disposition to be able to fully undertake the role of a first aider within the workplace. They should have good communication skills, and be reliable and able to cope with stressful and physically demanding emergency procedures¹.